Sometimes, you may have to quickly record audio on your Mac, no matter if it comes from an external audio card, from some internal software or internet sites, then edit the audio files as fast as they've been recorded. In that case, it could be tiresome to launch Pro Tools, Logic or any other DAW. Not to mention the worry about audio routings, sometimes complex, not to say impossible. So you'd like a small software, very light on CPU and which could be launch immediately. And what about an innovative audio editor, non-destructive and lossless, or the possibility to simultaneously record two audio sources, and manage recordings in a clever library, etc. That's exactly what is offering Ambrosia with WireTap Studio, the new version of its WireTap Pro. Let's see if it keeps all its promises. You can appreciate several help windows, some redirecting to video tutorials online. On the whole, Ambrosia has been careful to give all the help needed, even if it will not often be used, as the software is simple to use and easy to understand. WireTap Studio (WTS from now on) has four main windows. First one, the Controller. There you'll find transport commands (Rec, Stop, Pause), Live Preview button (see below), a pull-down menu for the various audio formats, a time display, two little bargraphs, some shortcuts to various functions/windows (Preferences, Effects and Library). Finally, two input slots allow to choose two audio sources in a pull-down menu, no matter if they are internal or external. That's the first big difference with WTS rivals. Second window is Recording Sessions. A Session holds the entire parameters needed to prepare and start a recording... session. That is to say practically all WST functions : selection of audio format, sources, destination, effects, and a clever Schedule. With this latter, you can program and plan in year, month, day, hour, minute and second a recording, It could be a one time recording or a recurring one (daily, weekly and monthly), an internet radio show for instance. It can activate the Mac if it is in sleep mode, and even switch it on (an option to tick in the Preferences). A nice function, called Processing, allows to launch a script, to open a file or an URL, before and after the recording session, depending on fixed settings, from 5 seconds to 2 minutes. We'd like to be able to manually define this pre-processing period of time, because opening a web browser, an URL, a media player with its buffering time could sometimes take longer than 2 minutes... But you can still anticipate by bringing forward the recording. 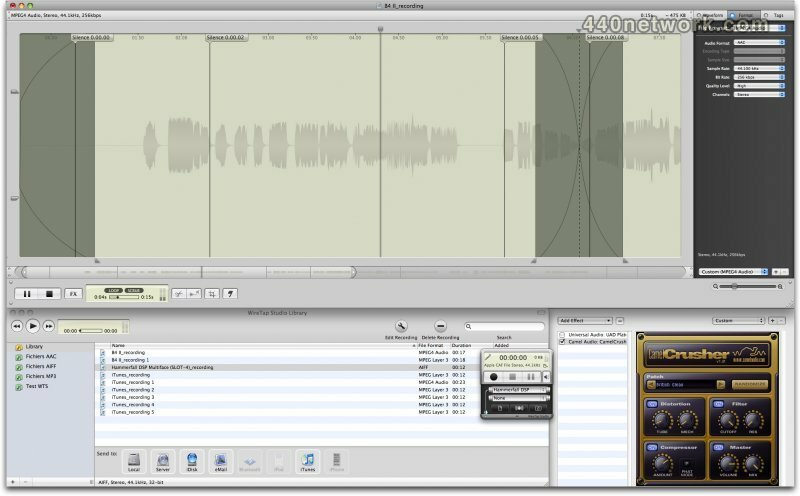 This Recording Sessions window not only allow to program a complete recording session, but it can also be used as a preset manager, where you'll pick the appropriate one, depending on the software, sources, audio format, etc. Third window, the WTS Library, very similar to iTunes library. All the recordings will be listed here, filed under a generic Library folder. But you can create you own subfolders. One thing to know : WTS "encapsulate" the various recordings in a folder named WireTap Studio Library (in Users/Home/Library/Documents) that you can't open. Therefore, recordings are not directly available (except if exported). It may seems an odd choice, but it's perfectly understandable once you take the record and edition concept in account (see below). Direct Export can also be managed from this window. You can export to 8 destinations or formats : internal storage, to a server, an iDisk, by Mail, Bluetooth, to an iPod, iTunes or an iPhone. It's complete and very easy to use, the shortcuts are editable, and the export is done by a simple click on the relevant icon. This export will apply all Edits, audio compression and effects. There's another option (right click on the file name) : you can export the Lossless recording or group in a package (proprietary format .wtpt) recording and Edits history. However, there's a little bug : when selecting certain audio formats, Format window (in Preferences) becomes blank, WTS freezing on last settings, or even quitting. Ambrosia has sent me the last beta of the forthcoming update (just a matter of days before its release), and these issues are fixed. Just a regret : in view of the encoding/decoding process, the audio signal is subjected to latency (almost a half note at 78 BPM, with the Mac audio settings at 48 kHz). With such a latency, you can't use Live Preview while playing an internal synth or an external source. But as you can "monitor" the compression process before recording, it's not really important. BTW, the true "monitor" function can be activated by Ctrl+Click on the HP icon. One of the most important functions of WTS is the simultaneous recording of two sources. For instance, a virtual instrument and a miked voice in order to save a sudden idea, or audio from Quicktime or other apps and a voice-over, or two signals, one coming from the stock audio card the other from an external audio card, etc. In short, you can record any audio source, whatever it comes from, and process this audio source, notably thanks to Camel Crusher. Before explaining the fourth window, the audio editor, we would like to point out the simply brilliant recording process : audio recording is non destructive even if you apply severe audio compression (MP3, 3GP, etc.). When you record an audio signal, WTS queries the input device/software it is recording from for the maximum quality it is currently configured to output, and apply this format for the lossless recording. So, back to the audio editor. Here you'll find all basic functions, like adding Markers, cut, erase, normalize, add Fade In and Out (three curves available), add Silence, tags (for MP3 and AAC files), etc., in a non-destructive way. Loop and Scrub mode are optional. You can zoom at sample level, with a display in hour/minute/second. Note that there's a little bug that slightly de-zoom when playback is stopped. Fades are graphically applied, by moving tiny cursors on the bottom, as well as gain change, with cursors on the left. If you record two sources, their volumes can be adjusted independently (extra cursors then appear on the right). A small regret : you can't move the Fade cursors when playback is on. But we really like the graphical handling, as well as the undos that are available right in the waveform (by a tiny arrow), and the overall concept. In view of the ergonomy and the ease of use, we wish that this technology could be used in a complete audio editor, with all usual functions (and more). If it ever happens, such an audio editor would be a killer app, without any rivals on Mac. WTS offers a large range of audio formats : 3GP and 3GPP2 audio, AMR, AAC ADTS, AIFC, AIFF, CAF, MP3, Mpeg4 Audio, Mpeg4 Bookmarkable, NeXT/Sun, Quicktime Movie, SDII and Wave. From 8 to 64 bits, from 8 to 96 kHz (RME Multiface limits ? ), constant bitrate or VBR, etc. A few bugs, almost fixed, don't tarnish WTS efficiency. WireTap Studio will be of a great help, from internet recording to the conversion of an audio file in numerous formats (including phone formats), from DVD recording to the use as a musical sketchbook and others sonic manipulations. Ambrosia has already created an essential tool for Mac users, SnapzPro X. There's no doubt that WireTap Studio is the second one.